Thank you to all who came to our Scary Tails Trick-or-Treat and haunted photo set! Hundreds of our neighbors turned out at my Bloomfield store on Halloween day to Trick-or-Treat with their pets. We hope you all went home with lots of dog and cat treats, as well as Halloween candy for you! We loved all of the very creative costumes – both pet and human! Wow! We also have lots of pictures to share with you –of the Trick-or-Treaters and also of pets and their people with Frankenstein at our haunted photo set. Everyone was so great about waiting for their turn – we thank you and your pets for your patience! For $5 our neighbors went home with a printed photo or for $10 they could get a flash drive of multiple pictures. We raised nearly $600! All donations went to Cat Tail Acres Sanctuary in Armada, Michigan. Cat Tail Acres provides a home to feral cats and cats that are unadoptable. The organization is run by volunteers so every penny goes to buy food, cat litter, supplies and to pay for veterinary care. I am sure they will be thrilled with your contributions! Awesome job everyone! We hope you enjoy these pictures! I had a busy day on Halloween! 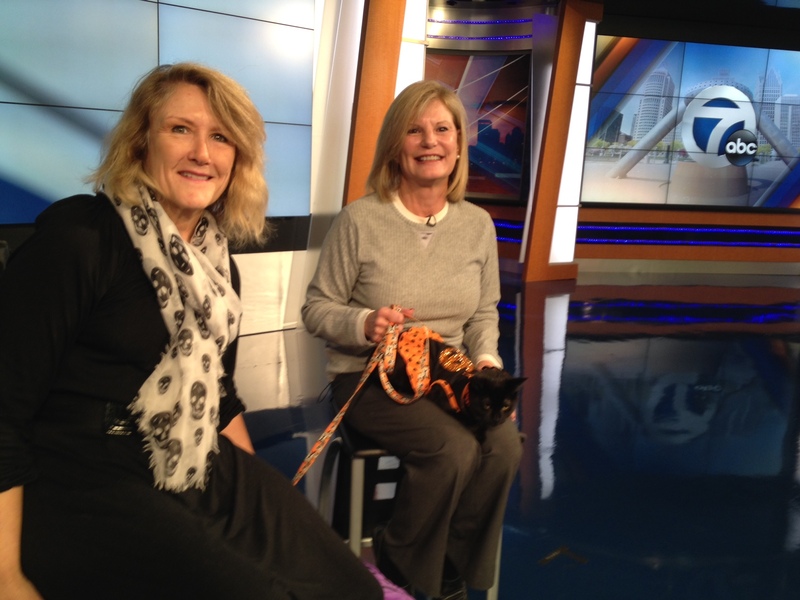 It started with a trip to WXYZ – Channel 7 for a news segment on our Scary Tails Trick-or-Treat and haunted photo set that we were holding later in the day at my Bloomfield Twp. store. Here we are in the studio getting ready for our live segment. I have already been fitted with a microphone and now we are just being positioned in the studio in which the interview will take place. Photos: Addy Shattuck (right) with Linda Wasche our store marketing person (left), along with Purdy (dog) and Todd (cat). I have been on TV a number of times now, but never get used to it! My interview was with WXYZ anchor Nima Shaffe who was great! In fact, everyone at WXYZ was great. They make you feel so welcome. Plus we met a lot of pet lovers! The pets that went on TV are Purdy and Todd. Purdy is a wonderful dog whose family shops at my store. I am not sure how much Purdy liked the spider costume that we put her in – but she was very calm and seemed to like the attention. Thank you to Purdy’s Dad, Scott, for letting her go on TV! Todd is an adorable little cat who didn’t seem to mind the pumpkin dress we put him in at all. That says a lot about this little guy who is currently up for adoption in our Bloomfield Twp. Kitty City. Click here for a photo gallery of our Scary Trick or Treat and haunted photo set! 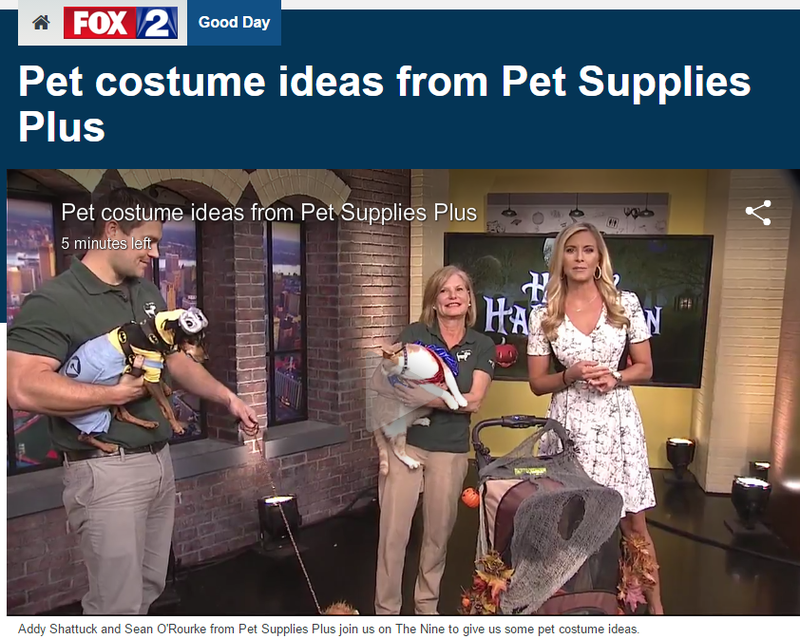 Our District Manager Sean O’Rourke and I were invited to go on Fox 2 Detroit to talk about what’s new this year in Halloween costumes for pets. See pictures of us preparing for our LIVE TV segment below with Gus (as Wonder Woman), Dino (as a Minion), Simba (in the stroller as a pumpkin in a haunted pumpkin patch) and Bambi (as a Lion). What’s hot in pet costumes this year? Movie and TV characters are popular again this year, along with the old-time traditional costumes like pumpkins and lions. How much does the typical costume cost? Expect to pay about $20 for a full costume; much less for accessories such as bandanas and hats. What if my pet won’t go on a leash? Consider using a stroller or pet carrier for your cat or small dog and making it part of the costume. See our haunted pumpkin patch stroller below! What is the best place to take my pet Trick-or-Treating this year? Pet Supplies Plus in Bloomfield Hills! Pets in costume will be Trick-or-Treating for pet treats and food samples at multiple stations set up around the store. It all takes place from 11 a.m. to 3 p.m. on Halloween – Saturday, October 31! Also visit our haunted photo set and have you and your pet’s picture taken with Frankenstein! Click here for more info! Here we are on Fox 2! Click here to view the full segment. Addy Shattuck with Gus as Wonder Woman and Bambi as a lion. Simba as a pumpkin in a stroller decorated as a haunted pumpkin patch. 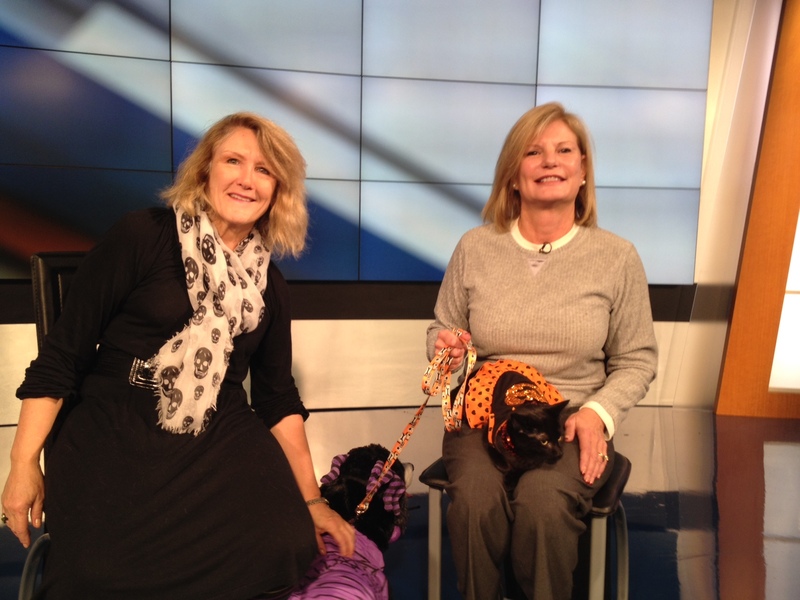 Halloween – like any holiday – includes its share of potential hazards for pets. Our Scary Tails Trick-or-Treat offers a safe environment for celebrating Halloween with your pet. Plus your pet will get his or her own treats so they may not be as tempted to try to get into the human treats! So we are excited about offering this for the first time this year. See my blog, “I want to be scared,” for store locations, and event dates and times. The last thing anyone wants to do is spend Halloween at the pet emergency hospital! With planning and preparation, you can prevent an emergency and make sure that your pet is safe this holiday. Keep pets safe in the house. Pets left outside can become frightened by holiday noises and crowds. They can also be subject to some pretty scary Halloween pranks and rituals. So be sure to keep pets inside. Also be mindful of pets who might bolt out the door when you open it for trick-or-treaters. I have to be mindful of my cats – and often put them in another room with the door closed. I give them treats, a litter box and some toys. It’s only for a few hours and I would rather that they be safe than risk one of them getting out. Avoid using lit candles and instead opt for battery operated ones. Never place strings of electric lights near the floor where pets can become entangled. In addition, never leave holiday lights on when no one is home since they pose a fire risk, especially if wires get chewed or frayed. Do not leave glow sticks and fake blood in pet’s reach as the contents can be toxic. Only hang fake cobwebs up high where pets cannot reach them as they can cause choking or entangle pets. Remove small decorations or any with removable pieces that could become choking hazards. Keep human treats away from pets. Make sure all Halloween candy is stored up and away from pets. 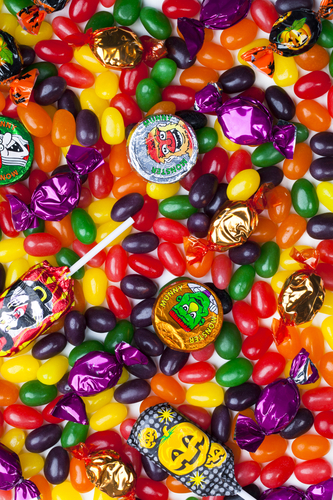 Allow children to only have candy with adult supervision so that you can make sure candy doesn’t get shared with pets. If you suspect your pet has eaten candy IMMEDIATELY call your veterinarian, emergency hospital or Poison Control Center. I have cats at home – and I will tell you, NONE of them will put up with a Halloween costume. So what do you do if you want to participate in Halloween festivities, but Fluffy or Fido only want to wear his or her birthday suit? If your pet does not appreciate putting on a costume, don’t. The last thing you want to do is stress out your pet. Instead, consider these options – – that can be just as fun if not more fun — than a store-bought costume. Look into pet air brushing. 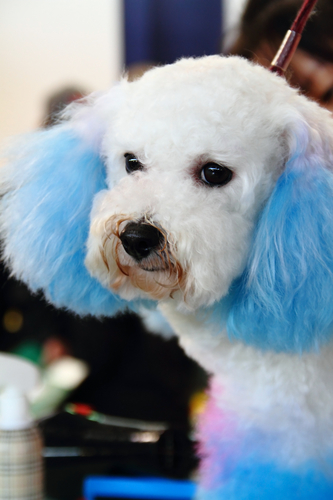 This technique uses pet-safe dyes to “blow” color onto a pet with a small air compressor. It’s become very popular among pet groomers and stylists. This technique is used on dogs and cats and puts color only on the pet’s fur. Ask your groomer about this technique. If your pet will not tolerate a full costume, maybe he or she will wear a bandana. Bandanas are simply a triangle-shaped piece of fabric that is tied (loosely!) around your pets neck. Visit your local fabric store for colorful holiday-themed fabrics and cut out your own bandana to fit your pet. Remember to keep the bandana loose enough at the neck – but secure so that it does not drag and trip your pet. Have a pet rabbit? Go as Alice in Wonderland. Have a Terrier? Go as Dorothy and Toto. Have a Dalmatian? Go as Cruella de Vil. Have a cat? Go as the crazy cat lady (now that’s an easy one!). Consider decorating with colorful holiday-themed ribbons, twine or trim. Again, make sure that what you wrap around your pet’s accessories is not restrictive or binding to your pet. You could even purchase an inexpensive leash and top it with glitter or fake “jewels” or pompoms. Shop your local dollar or craft store for ideas. If you have a smaller pet, you may plan on putting him or her in a wagon, pet stroller or pet carrier. Decorate the vehicle. You might use some of the same ideas discussed above for leashes. Based on the type of pet you have, you might consider a clever theme. Be creative! 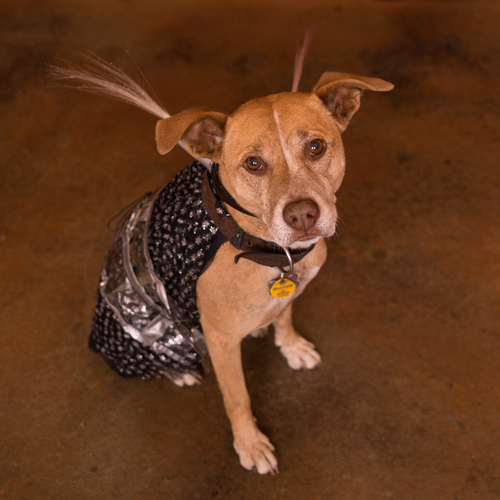 In 2014, Americans spent an estimated $350 million on Halloween costumes for their pets. (Source: National Retail Federation) That’s a lot of costumes. But how do you know if you are choosing the RIGHT costume? Avoid any type of face or ear covering like masks that may confuse or disorient your pet. Watch out for ties or decorations that hang down and could trip your pet — or get tangled in their legs.. Choose a costume in which your pet can easily stand and move. Avoid costumes that have removable parts – that could fall off — or get chewed off — and potentially choke your pet. Or take off any removable pieces before you use the costume. Avoid costumes that are restrictive in any area of your pet’s body, especially the neck. Always check to make sure you have a loose, comfortable fit around the neck, tail and legs. Choose bright colors so that people can easily see your pet – especially if you are going to be in a crowded or dimly lit place. Come in to any one of my three stores – in Bloomfield Hills and White Lake – for our haunted photo set with a real-life Frankenstein and other ghouls. A $5 donation will get you a photo of your pet; a $10 donation will get you a flash drive with multiple photos. All donations go to Elizabeth Lake Animal Rescue of Waterford and Cat Tail Acres Sanctuary of Armada. Bloomfield Hills at 2057 S. Telegraph, 11 a.m. to 3 p.m., Saturday October 31. White Lake at 6845 Highland Rd., 4 p.m. to 8 p.m., Friday, October 30. White Lake at 8020 Cooley Lake Rd. , 11 a.m. to 3 p.m., Saturday, October 31. Enter your email address to follow my blog. Blog followers are automatically entered into regular drawings to win a $10 gift card good at any of my 3 Pet Supplies Plus locations! One card per winner per year. Winners agree to allow us to contact them via email and to announce their names as winners in our blog. As a follower, you will also receive special discounts off frequently used pet products. Please allow 1-2 weeks for coupons to begin.